Come sneak a sip (many sips) of our 2017 Barrel-Aged Might Meets Right & Variants February 16th, from 9 pm till close. ¡La Sorpresa! is aged with a myriad of ingredients like roasted cacao, toasted cinnamon, vanilla beans and three types of dried chiles - ancho, New Mexico and arbol - to give this variant a satisfying kick of flavor. Try them all - $50 gets you four 6-oz. pours, a souvenir glass to take home, AND a variety pack of each of the 4 variants - not to mention, bragging rights of having been one of the first to sip on these new releases. 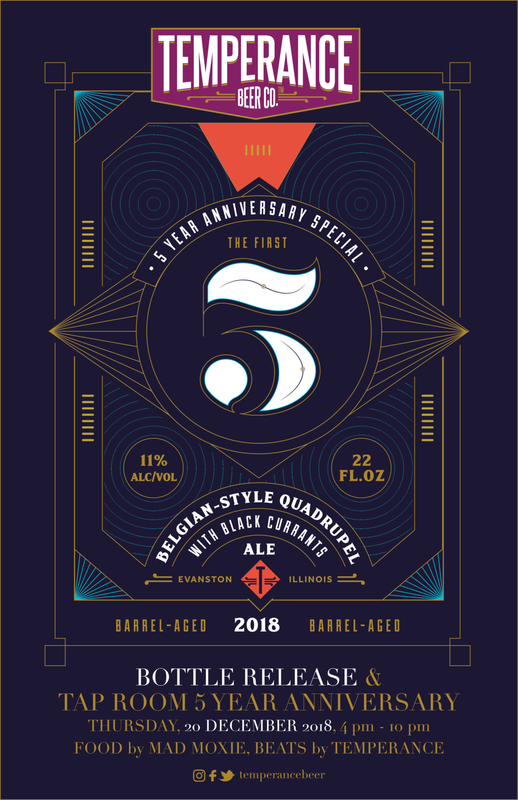 We're celebrating the kind of crazy fact that beer has been brewed commercially in Evanston now for FOUR YEARS!! So we're partying at least half the day. We've got special giveaways, special tappings, The Fat Shallot food truck from 5 - 9 PM, DJ Shazam Bangles, DJ Teebot, and DJ Madrid from 5 PM - Midnight, and a FREE Magbooth photo booth from 7 - 11 PM! Oh, and a mechanical bull outside from 7 - 9 PM. Each beer will be on tap for two hours or until it runs out, whichever is first. Only one sixth-barrel of each!